Do you know when your stitching operators start stitching garments in the morning and when they stop working before leaving the factory in the evening? It seems very difficult to record all operator’s actual start and stop time. Is it practically possible capturing all operators exact work start time and work stop time? Yes, this is possible with the help of technology solutions. With the manual aid, this much in-depth data capturing is not possible. Currently, most of the garment units have CCTV on every corner of the factory and shop floor. A dedicated department or factory owner (in small factories) keeps eye on the floor whether operators are working or not, what the operators are doing. CCTVs do some work on stopping operator doing unethical practice on the floor. But from the CCTV recording, one can't create operators work start/stop time report. 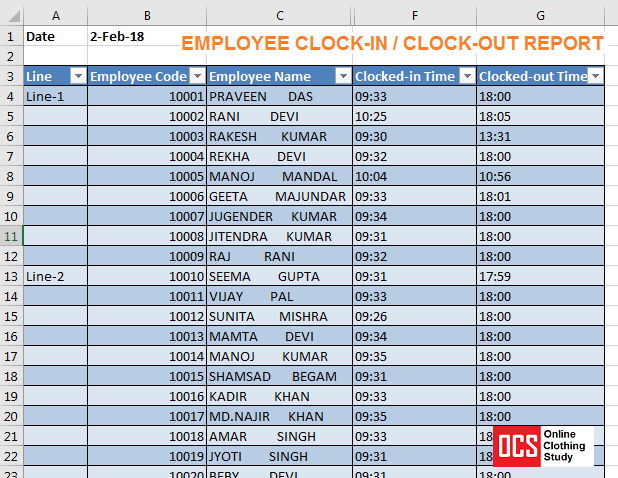 Payroll clock-in (when employees enter the factory and when they leave the factory in the evening) data is not enough these days to improve the shop floor performance. As you don’t know how many hours operators attended the work from the payroll clock-in/clock-out report. Secondly, it is not possible for a supervisor policing operators everyday morning, whether operators started sewing garments after reaching to their workstation. Having a technology solution a factory can keep eye on exactly when an operator is starting his/her sewing machine and starts sewing the first piece in a day. Third, when the last piece is stitched, that time can be also captured. If one can record such data, you can show it to your operators. Then operators would not get chance to waste their productive time. Why one should have true data for work start and work stop time? It is true that in morning operators need time to warm up and catch the real stitching speed. If nobody is watching them when they are starting their work, they will take a longer time to warm up. That is why the first-hour production normally remains less compared to following hours. In an assembly line, many operators will not have work to sew - they wait for getting work. If their first bundle start time getting noticed, they will pull work and start their machine. You can reduce operator idle time by having and analyzing idle time. This, in turn, improves resource utilization and improve floor productivity. Operator’s non-standard efficiency and real efficiency calculation will be easier when you have clock-in and clock-out data. Work start and stop time is also represent as clock-in and clock-out time. Following technologies can you you caturing operator actual clock-in and clock-out time. A programmable sewing machine that can record sewing machine running time (clock-in and calendar date). Here I will show you one basic report of sewing operators clock-in and clock-out report from their workstation. I had prepared this report for one of the garment manufacturing units. Operator clock-in and clock-out to/from the workstation data. These data are taken from shop floor control system. From this report, a line supervisor, exactly know which operator has started working at what time and till when they were on their workstation. From the database, one can further prepare a report with exactly when the first garment is started. Know the importance of operator clock-in/ clock-out time in improving floor performance.